With energy prices climbing and concern for the environment on virtually everyone's mind, maybe it's time to rethink and recycle some old ideas about how we dry our clothes. The sun and the wind will still do a fine job of drying our clothes--just like they've done for centuries--and you won't use any nonrenewable energy (plus as an added bonus, your clothes will come back smelling fresh as all outdoors--not some manufacturer's perfumed version of outdoor freshness). Putting up a clothesline isn't hard--and within a weekend you can start saving money and enjoying naturally fresh-smelling clothes. Here is how to do it. Figure out what kind of clothesline you want. An umbrella clothesline has some advantages in that it doesn't take up a lot of room (which makes it a good choice for a small yard) and can be installed so it's removable. The old fashioned T-bar clothesline requires more space, but has the advantage of allowing more air movement through your clothes; so they dry faster. Plan on installing your clothesline away from overhanging wires and trees to avoid bird droppings and tree sap. Also try to stay away from walking paths or gardening areas. Call before you dig. Installing your clothesline will require you to dig at least one (umbrella stand) or perhaps two holes, so be sure to contact your local utilities (cable, phone, water, power) to mark where their services run on your property before you start digging. Dig a hole at least 3 feet deep using your shovel or posthole digger. This will provide good solid support and if you live in an area where the ground freezes in winter, it will get you down below the "frost line" so you won't need to worry about your clothesline shifting when the ground thaws. Pour a bag of posthole cement into the hole, add water (follow the instructions on the bag) and place your clothesline post into the hole. Use your level to make sure the post is straight (plumb), then brace it in place and allow the cement to dry overnight. Finish your clothesline by installing your clothesline pulleys and the clothesline itself. Measure to the center of the 3-foot crosspieces. Center a piece of 4x4 on that mark and then mark both edges. Use your power saw (set to 1 1/2-inch depth) to make a series of parallel cuts between the markings, then remove the waste wood. Set the (now notched) crosspiece on top of your pole and fasten it in place using carriage bolts driven down through the top of the crosspiece into the beam. Make your umbrella clothes hanger removable by first installing a piece of plastic pipe (slightly larger than the base pole of the umbrella hanger). Cover one end on the pipe (to stop it from filling up with cement), then push the pipe down into the wet cement. Use your level to make sure it's plumb. Cut off the plastic pipe at ground level once the cement has dried, so you won't need to worry about someone tripping over it. It's a good idea to install a clothesline tightener to a regular clothesline. This is an inexpensive metal bracket that fits between the lines and stops them from drooping under the weight of the clothes and dragging clothes on the ground. 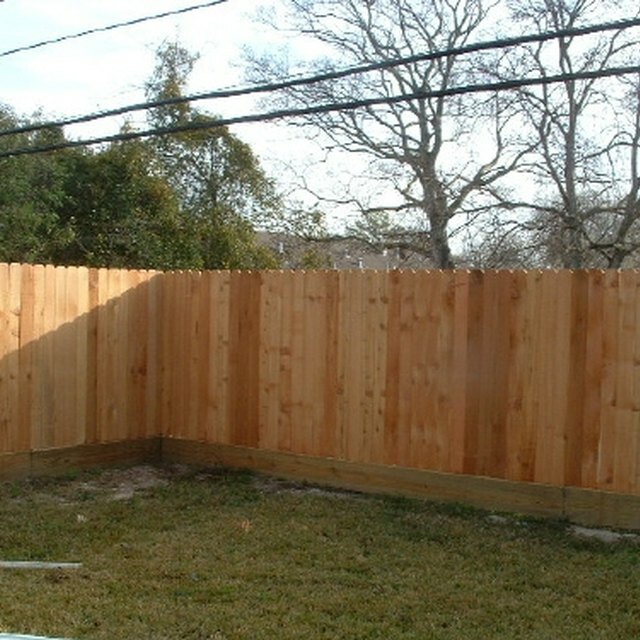 Pressure-treated wood, cedar or redwood are all good choices for your clothesline since they will resist the weather. Try to position your finished clothesline so it's about 2 or 3 inches above the head of the person who uses it most. At that height they won't have to be constantly reaching well above their heads to hang clothes. I learned home repair and maintenance hands on. Over the past 30 years I've built sheds, decks, fences and gates and planted numerous trees and shrubs. Inside I've done all the common jobs like repairing and installing toilets, plumbing and light fixtures plus I've transformed three basements from bare concrete floors and walls into warm , bright family rooms. I write on home maintenance and repair for DoItYourself.com and answer maintenance and repair questions online at MyHomeImprovement.com. How Do I Build Bamboo Gazebos?